love the whole post!! green dress is amazing! Absolutely stunning pieces. Totally jewels of a find. You work this shoot perfectly with your long flowing hair and height... it definitely creates the effect of this shoot. these photos are so incredibly amazingly beautiful! love this post!!! you really do remind me of a mermaid.. lovely scenery as well!!! These photos are beautiful! Like all the shoots you do, they seem so mature. THESE ARE AMAZING! The one next to the mossy post....breathtaking. oh my gosh, stunning hair! and this so reminds me of the little mermaid, well done! This is by far my favourite of all the shoots you have posted on your blog! The lighting, colours and settings of these photos are perfect, and I love the shot of you flipping your hair! What an odd yet striking dress...great find! The texture is fabulous. So so magical! Wow, this two piece is amazing. Whats the fringing made out of? I especially love the shot of you against the post and then against the wall on the steps, I love the positioning of your body in both. I hope you keep a big portfolio of all your shoots, it would be amazing to have a huge book to keep looking back at to see how you've progressed. Although I suppose your blog is like that, I'm forever looking through your older work, you're extremely talented. Well done for yet another amazing shoot Roz. ah its a shame you couldnt come to the grad shows, was it too far away? you have such an eye for amazing clothes! these are fantastic, you certainly looks like a modern Ariel! i lovee it! i could never pull off that dress, but i love how you pulled off the mermaid theme! Think these are some of my fav shots of you ever. They are beautiful! I have sent you an email too about a post I am writing! what a cool look - I admire your dedication to wake up that early for the light! "I do not think that they will sing to me. Again, you amaze. The intuitive thought you put into a story behind a shoot is incredible. Fish skeleton necklace to go with the "sea weed" dress? What wonderful details! The photos are wonderful, really more like a magazine editorial than a 15 year-old girls outfit post. And the Little Mermaid pre-Disney is one of my all time favorite "fairy tales." I'm obssessed with the melancholy mermaid theme. I want to do a collection called "La Sirena." Based on well you know, the tragic calling of mermaids. I would like to repost these pics when I do. stunning pictures love the dress! wow, you literally look washed up on shore in the fourth picture! Brilliant! you never run out of ideas, do you? I'm anxiously awaiting your next post...I hope it comes sooner than later!! the 'dress' looks like such a special find, and i love the simplicity of the shoot. 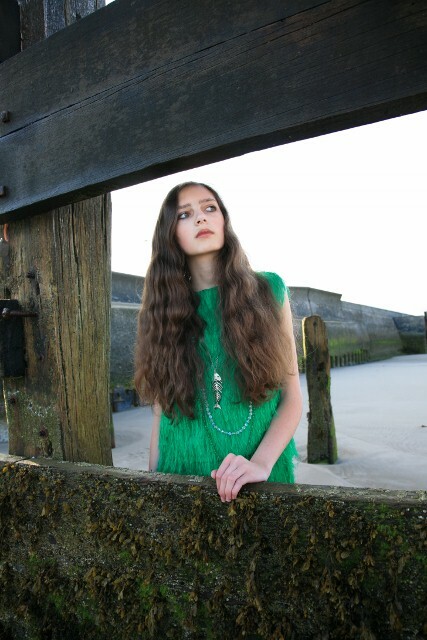 The greens of the dress look so vibrant, next to the moss/seaweed :) All the elements of the beach and blue sky link so well with the vertical lines of the dress, it's a brilliant idea for a shoot and looks so spontaneous! The photo of you next to the pillar is just beautiful! The shapes compliment each other so perfectly. The pillar takes on an almost human personality. Easily one of my favorite posts of yours— keep it up! These pictures are just incredible!! especially the third one with you standing next to the log of moss, just stunning!! have you considered wearing the skirt as a dress? that's the first thing I do when I get along skirt.